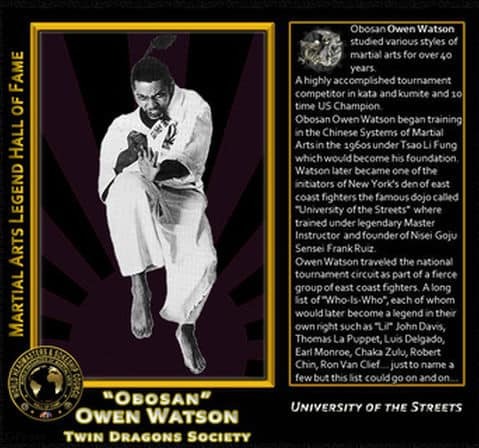 I studied Chinese Goju in 1973-74 in New York under a program supervised by Owen Watson. The classes took place at a Jerome Mackey dojo in Astoria, Queens. I recall Watson dropping by only a couple of times, but I was taught many classes by Sidney Filson. I believe she was married to him at that time. I was 11 or 12 years old and remember having a big crush on Sidney, who was very pretty. She was also a good instructor. The only other instructor was a sensei named Robert Chin. I made it to green belt, then my family’s finances could no longer afford the classes. The dojo was on the second floor above a dry cleaner which you had to walk past to get to the stairs. To this day, whenever I enter a dry cleaner, the smell of the chemicals instantly takes me back to those Chinese Goju classes.